UCL was founded in 1826 and is today among the world’s top universities, with 21 Nobel Prize winners having come from the UCL community. It has a global reach, with more than 30% of UCL students coming from outside the UK, attracted from nearly 140 countries around the globe. UCL covers a wide range of disciplines, including the Department of Mechanical Engineering whose focus is in three main areas: marine, thermofluids, and bio-medical. In the Marine Research Group, UCL has established a long tradition of research in naval architecture and marine engineering, working closely with organisations such as the UK MOD, which sends all its postgraduate naval architects and marine engineers to UCL. The Design Research Centre, which is led by Professor David Andrews, is part of the UCL Marine Research Group. The DRC focuses on a particular approach to ship design, which is called the ‘design building block’ approach. The primary tool for the UCL ship design research is Paramarine. "Using Paramarine at the DRC we not only design innovative ships but we are also changing the way ships are being designed. We are primarily interested in the early stages of ship design, as the key phase and the most innovative. In doing this we work very closely with QinetiQ GRC providing feedback and input to improve and enhance the value and power that Paramarine delivers," observed David Andrews, Professor of Engineering Design, Department of Mechanical Engineering, UCL. "Using Paramarine at the DRC we not only design innovative ships but we are also changing the way ships are being designed." The DRC has developed an architecturally focused approach using ‘design building blocks’. 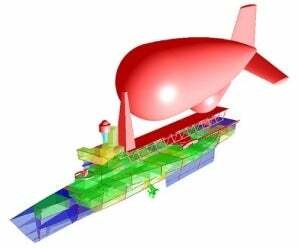 This allows naval architects to carry a wider range of explorations much earlier in the whole ship design lifecycle. This offers the chance to greatly reduce the risks associated with new ship design, gives designers more flexibility and, crucially, enables naval architects to make informed decisions much earlier in the design process while still delivering high-quality designs. "Naval architects have traditionally designed ships from the hull inwards. The approach that UCL has pioneered is based on designing the ship from the inside out with the hull wrapped around the key elements of the ship. This allows us to look at many more options. We use Paramarine because it has this flexible graphics capability married to the traditional numerically-based analytic software," said Andrews. Airborne early warning (AEW) aerostat tender. This was a design of a 1500te trimaran tender to deploy a large AEW aerostat for surveillance supporting a deployed surface fleet. British Maritime Technology – UCL mothership study. As part of a preliminary ship design team with a major consultancy (British Maritime Technology), the UCL design research team produced a series of novel ship concepts for a MOD-funded study. These were different fast ‘mothership’ configurations providing different means of loading and deploying small naval combatants and then transporting them over long distances so they could then be operated in a littoral environment. EU Visions very large cruise liner. A more unusual example of the application of the Design Building Block approach to Design for Production was an investigation of a very large cruise liner concept on behalf of the European Commission. In this short study, the UCL DRC assessed the feasibility of constructing a 400,000t displacement, 600m long cruise liner, which the Paramarine graphics capability readily facilitated. UCL has been using Paramarine for nearly ten years on a wide range of research projects. During this time, Professor David Andrews and the team at UCL’s Design Research Centre have worked closely with QinetiQ GRC to develop Paramarine’s capabilities. "I would defy any other marine design tool to be able to facilitate so readily the innovative and complex work that we undertake. Paramarine gives us a unique capability and allows us to push the limits of ship design," said Andrews. "Paramarine enables naval architects to explore design possibilities fast at the crucial early stages when most of the design issues ought to be nailed down. With the graphics capabilities in Paramarine, we can start to push the boundaries in configuration and the issues that were not previously addressed until late in the process. This capability can make a great difference to the final outcome." "Paramarine also allows designers to demonstrate to end users through powerful graphics what the vessel is going to look like, inside and outside. This enables the designer to have a good dialogue with a ‘non-technical’ customer. It is easy to create lots of ‘what ifs’ for the customer, which can have a huge impact on the finished design." "If a ship builder or designer buys into Paramarine, they are buying into a tool that is continually being changed and enhanced. At UCL we explore both innovative ship designs and new ways of designing," he concluded.